Great fun for kids aged 4-11. 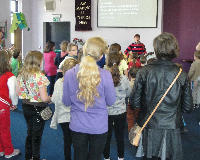 This very popular evening includes singing fun action songs, Bible stories, quizzes, games, prizes and lots more. Come and see what it’s like. Bring a friend with you, we’d love to see you and you’d have a lovely welcome.